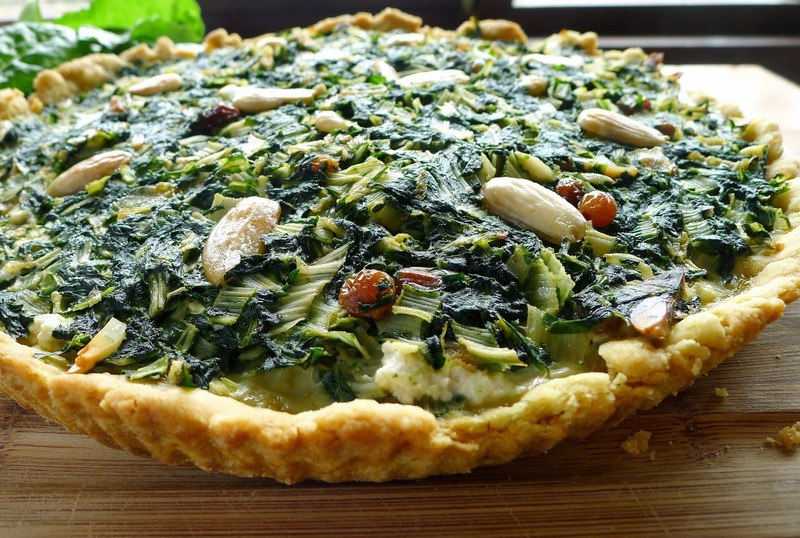 Chard and cheese pie for a vegetarian meal. 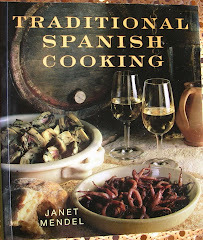 A friend recently asked me for suggestions for Spanish vegetarian dishes. Uh, well, hmmm. Oh, yeah, tortilla de patatas, potato tortilla (eggs, potatoes, olive oil). Truth be told, I couldn’t think of another dish that vegetarians would find everywhere in Spain. 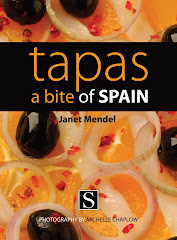 In your own kitchen, it’s easy to adapt Spanish recipes to a vegetarian diet. 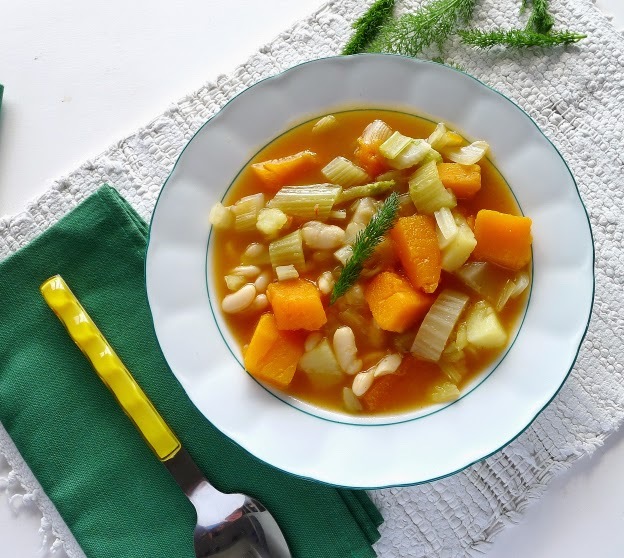 All those great legume stews, rice dishes, vegetable-based soups—all you have to do is omit the meat or fish. But, for a tourist traveling in Spain and dining out all the time, apart from dedicated vegetarian restaurants, the pickings are slim. 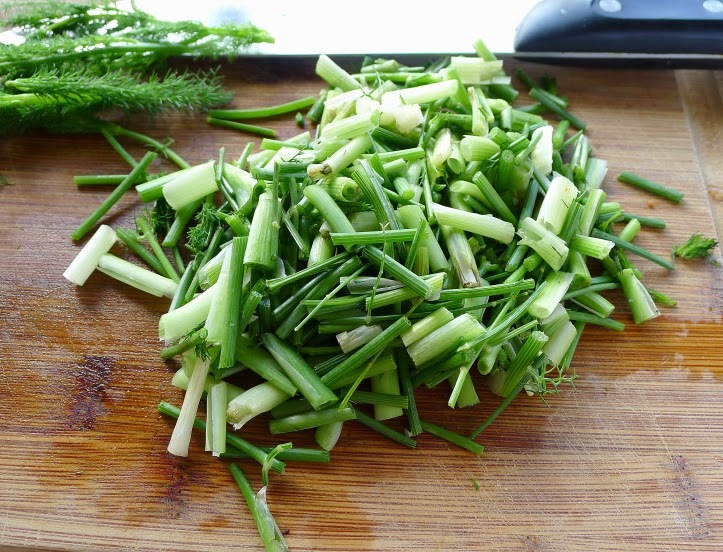 There are some seriously good vegetable dishes—fava beans, spinach, green beans—but they are invariably cooked with bits of ham or sausage. 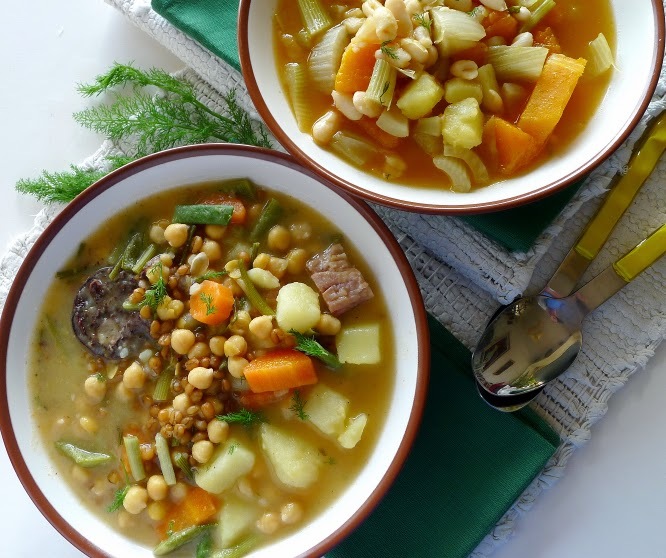 And the wonderful legume soups/stews, with chickpeas, lentils or beans, almost always contain meat, pork fat, sausages, ham bone, just for the flavor they contribute. During Lent, cuaresma, observant Catholics in Spain (as well as those who honor traditional foodways) abstain from eating meat. But, rather than consume vegetarian meals, they are more likely to replace meat with bacalao, salt cod, or other seafood. The section of the menu that most reliably includes vegetarian possibilities is Eggs. Besides the classic potato tortilla, other omelets, with cheese or vegetables, are good choices (assuming, of course, that the vegetarian diners are not vegan). Another category of egg dish is the revuelto, a sort of egg scramble with mushrooms, asparagus and garlic. Although revuelto often includes ham or shrimp (as do the versions I’ve published before on this blog), because it is made to order, it may be possible to order it without the meat/fish. A great tapa bar dish, huevos rotos, eggs “broken up” with fried potatoes, usually comes with ham, but can be ordered without. Another, patatas a lo pobre, “poor folk’s potatoes,” is often served as a side with fish or meat, but makes a great vegetarian entree. 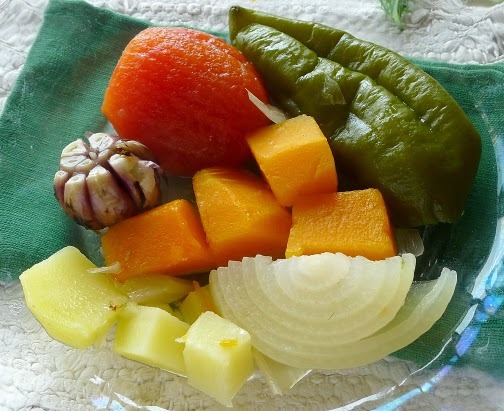 Gazpacho is vegetarian as is traditional sopa de ajo, garlic soup, made with water, not stock. 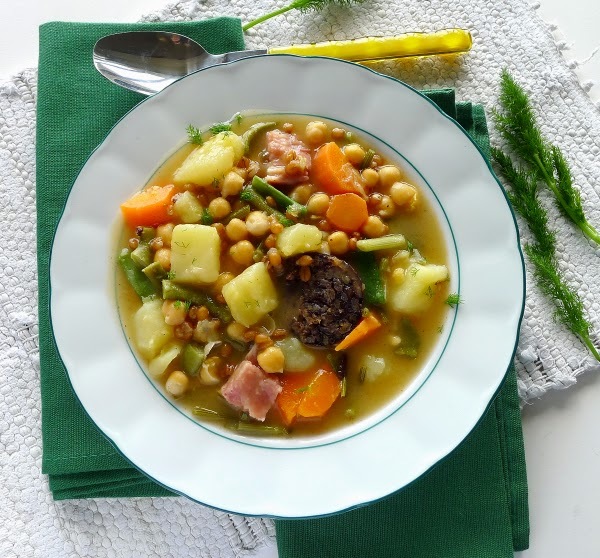 One great dish that is not only vegetarian, but vegan, is espinacas con garbanzos, a pimentón-flavored soupy-stew of spinach with chickpeas, a tapa bar specialty in Sevilla. Here are links to the spinach-chickpea recipe and some other vegetarian recipes that have appeared on this blog. Pisto, vegetable medley (somewhat like ratatouille, with eggplant, zucchini, tomatoes, peppers and onions cooked in olive oil). Patatas a lo pobre, "poor folk's" potatoes (potatoes layered in a cazuela with peppers, tomatoes, onions, garlic, parsley, olive oil). Paella, vegetarian paella (my version is with brown rice, legumes and lots of veggies). 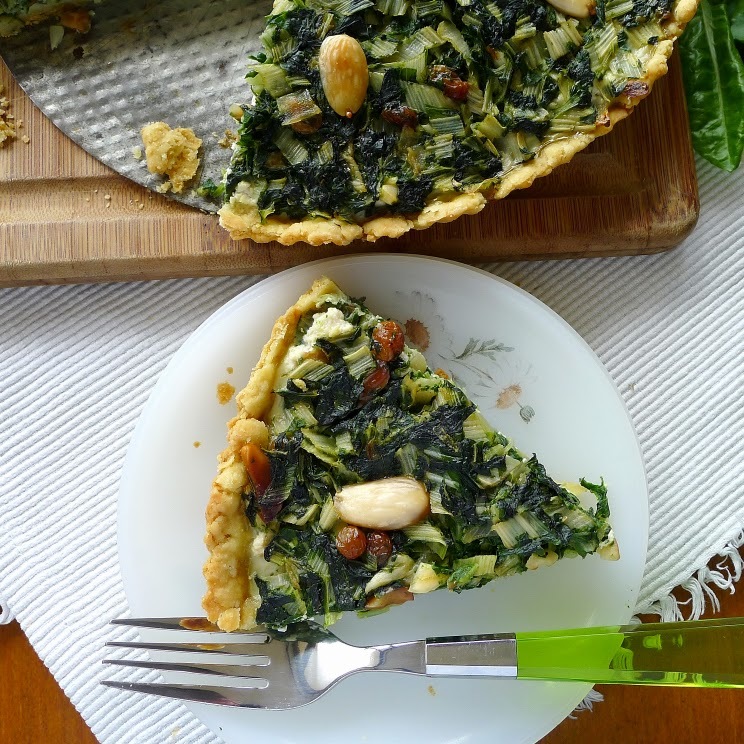 Nuts and raisins add texture to the chard. 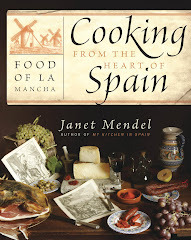 The vegetarian menu at my house this week features Chard and Cheese Pie, a recipe from COOKING FROM THE HEART OF SPAIN, FOOD OF LA MANCHA. The cheese is actually requesón, similar to ricotta. In La Mancha, where Manchego cheese comes from, it would be made with sheeps’ milk requesón, but any ricotta, feta or well-drained cottage cheese may be substituted. Flaky, olive oil pie crust for the pie. I’ve used a really easy, all-olive oil pastry dough for the pie. It makes a rich, flaky crust. No reason you can’t substitute store-bought pie crust. 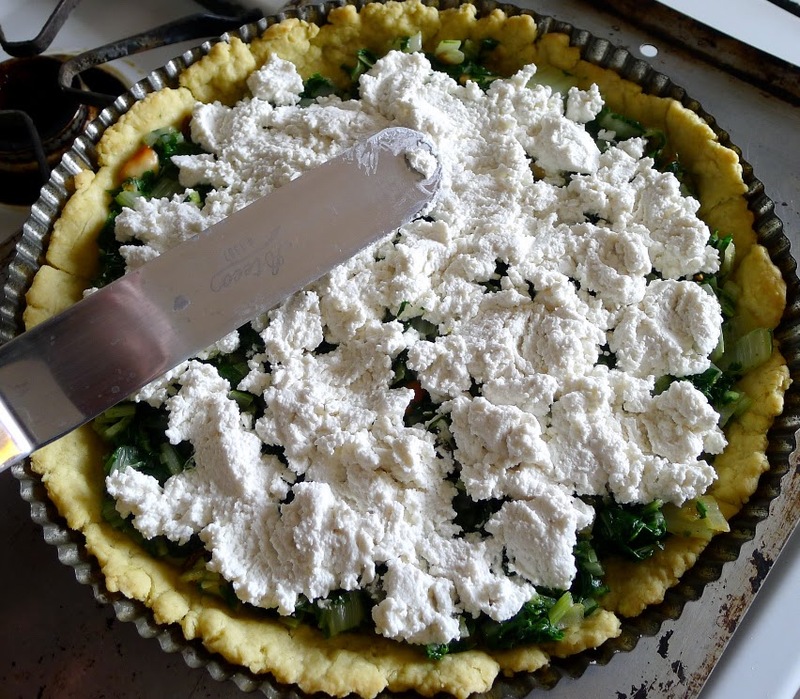 Pie has a layer of requesón cheese (like ricotta) in the middle. If you are making the Flaky Pastry (recipe follows) using two egg yolks, use the whites with one whole egg in this recipe. Otherwise, use two whole eggs. Flatten the pastry dough to make a disk. Place it in a 10-inch tart pan with removable sides. Press the dough firmly to cover the bottom and sides of the pan. Prick the bottom of the dough all over with a fork. Bake the crust for 10 minutes and remove from oven. Lower oven heat to 350ºF. 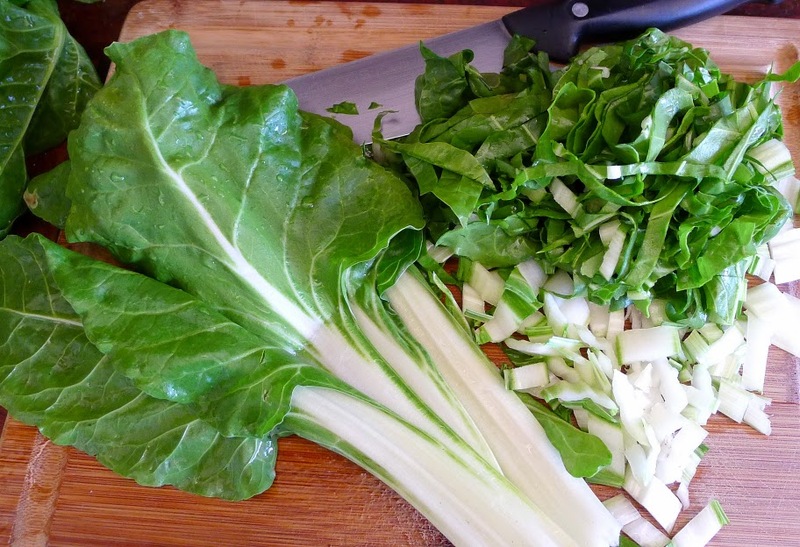 Cook the chard in boiling, salted water until tender, 15 minutes. Drain and refresh in cold water. Drain very well, pressing to eliminate all liquid. 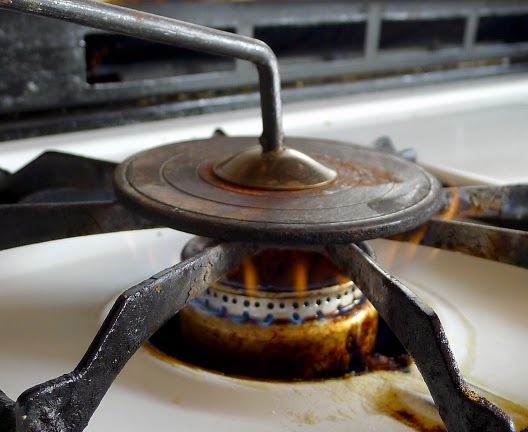 Heat the oil in a skillet and sauté the pine nuts or almonds until they are lightly toasted. Skim them out and reserve. Add the onion and garlic to the skillet and sauté until onion is softened, 5 minutes. Add the chard to the onions and sauté a few minutes more. Beat the egg and egg whites in a bowl with the pepper, nutmeg, ginger, cinnamon, and salt. Add the chard, raisins and half the pine nuts. Combine well. 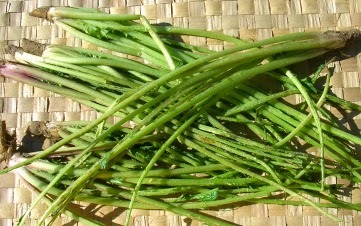 Spread requesón on the chard. 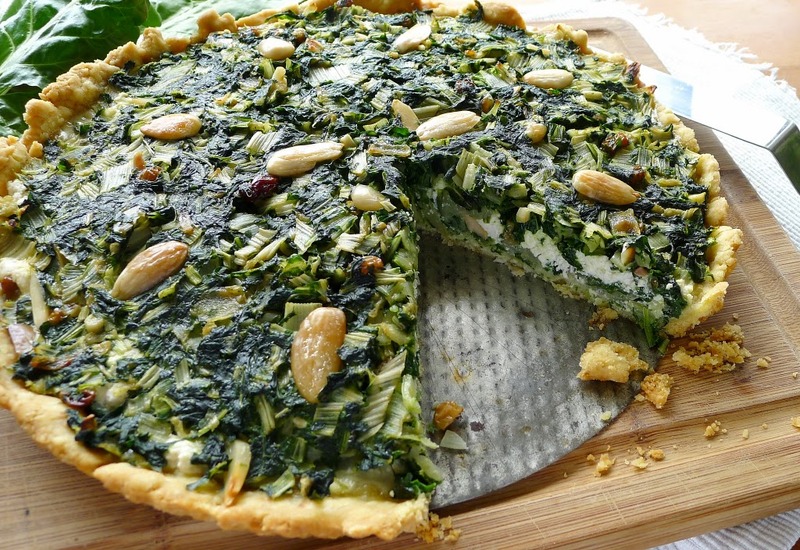 Pour half of the chard mixture into the crust. Spread the requesón on top. 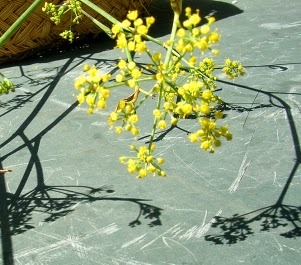 Cover with the remaining chard. 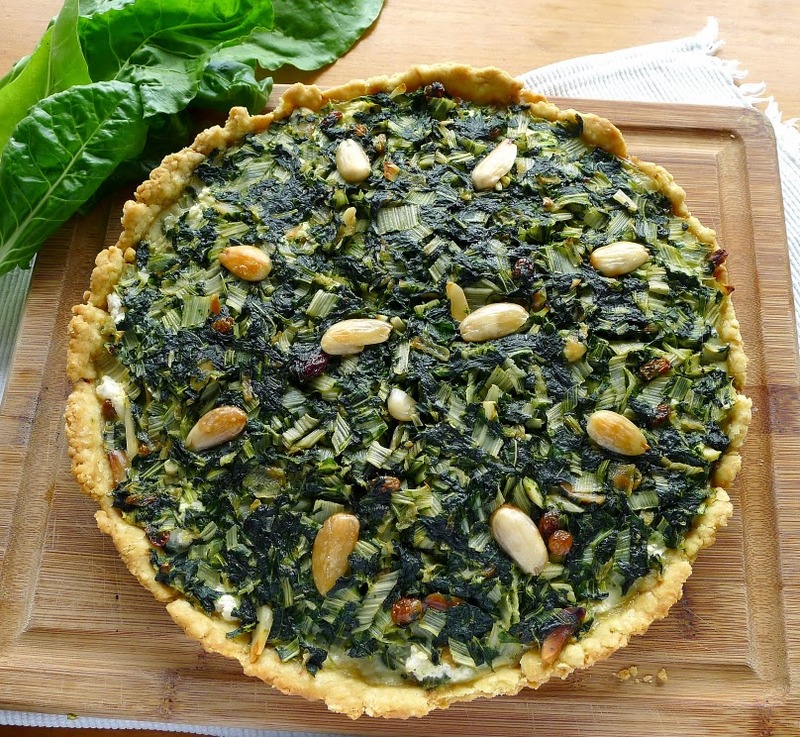 Scatter the pine nuts over the top and press them gently into the chard. Bake the pie until pastry is lightly golden, 35-40 minutes. Cool on a rack for 10 minutes. Release the crust from the sides of the tart pan. Remove the outer ring. Serve warm or cold. 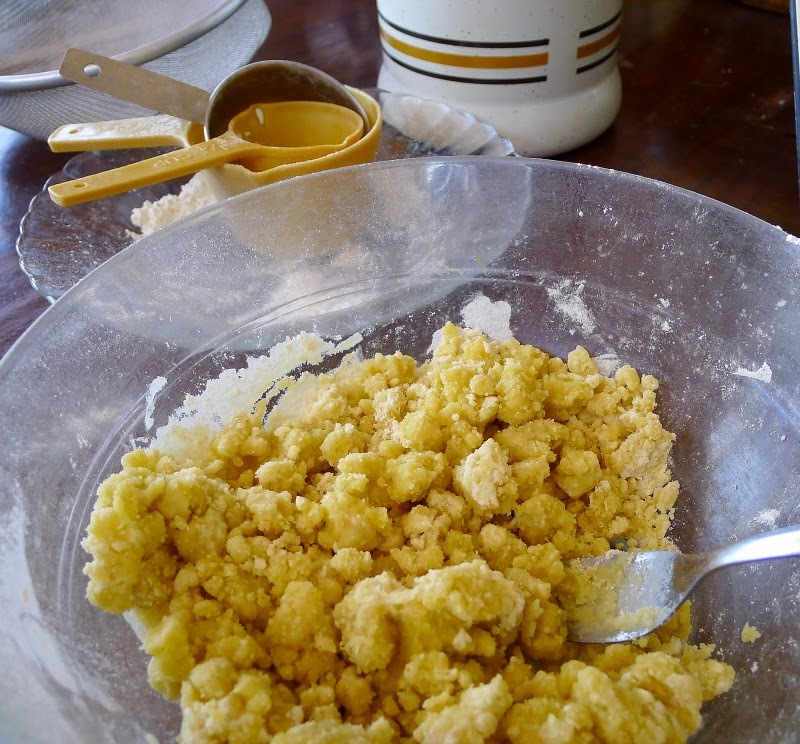 Use this dough for empanadas and both sweet and savory pie crusts. Be sure to let it rest at room temperature for at least 1 hour. The dough works well whether the crust is filled with raw ingredients and baked, or baked “blind” and then filled with a cooked filling. The dough freezes well. Thaw completely before rolling out on a floured board. Makes enough dough for a 10-inch pie crust. Sift the flour, baking powder and salt into a mixing bowl. 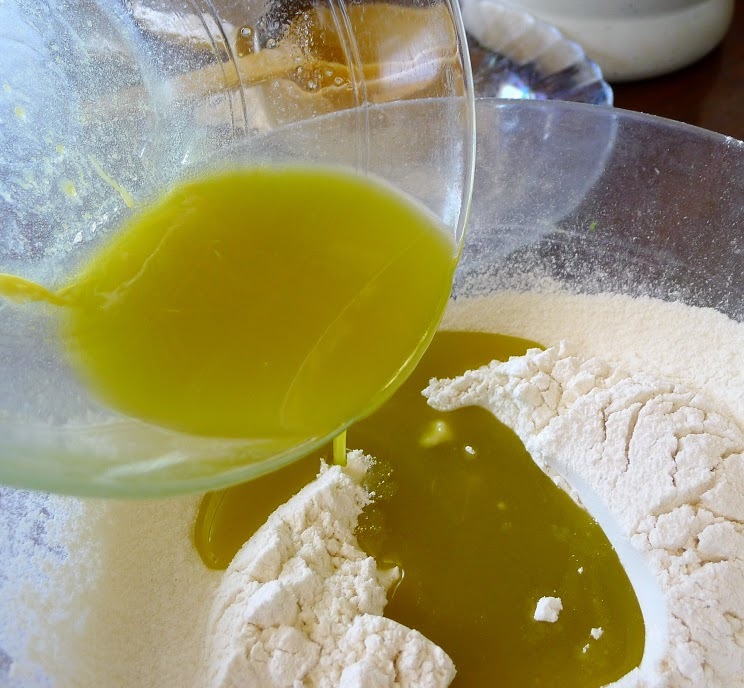 Mix oil and egg into flour. Combine egg yolks and the oil. Make a well in the flour and pour in the yolks. Use a fork to blend the flour into the yolks. Add enough of the water to make a soft dough that can be patted into a ball. Roll out the dough between two sheets of wax paper or press it into the pie pan. 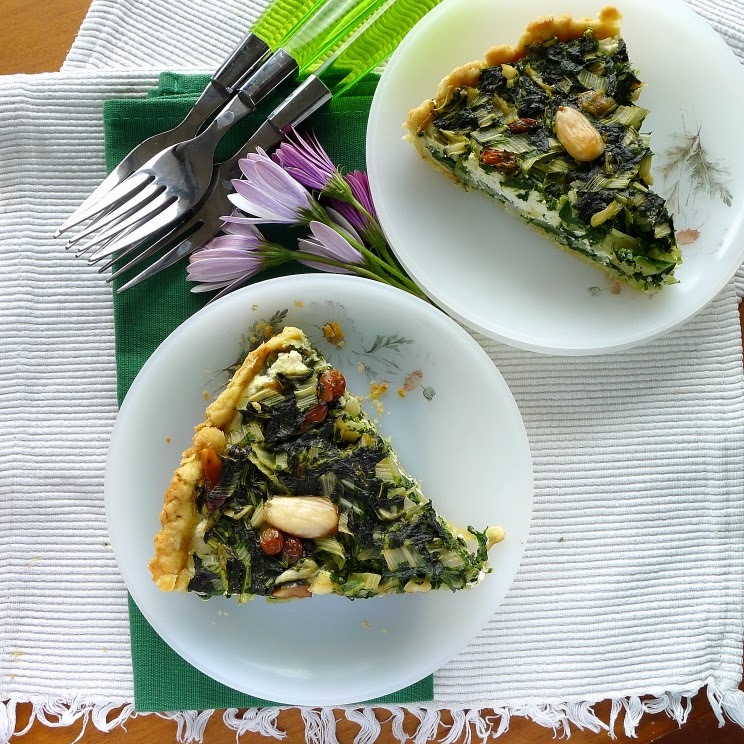 As starter or main, chard pie is a lovely springtime dish. In Spain, Father’s Day comes in mid-March, on the festival of San José, St. Joseph. Which may or may not strike you as odd, that the husband of the Virgin Mary, who, according to the story, was not the father of the child, should be honored as the representative of all fathers. 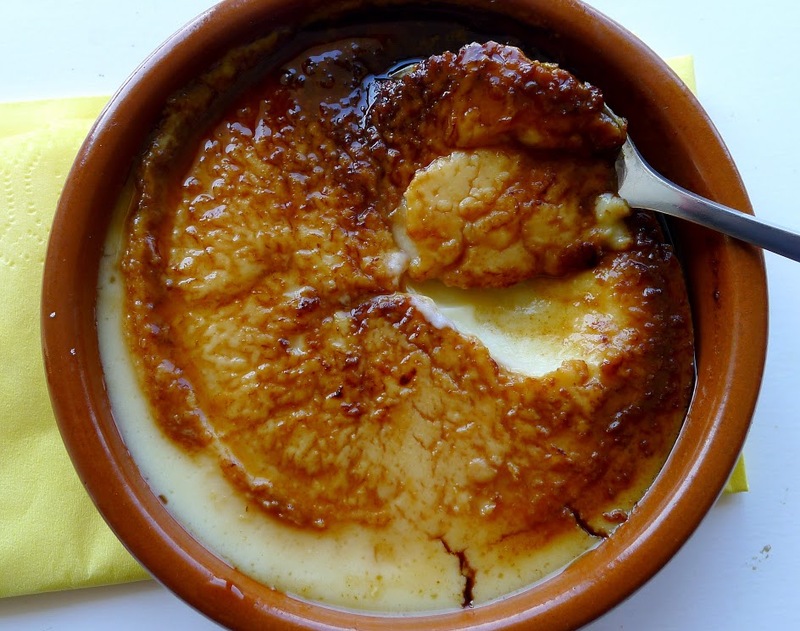 Be that as it may, the holiday is the perfect excuse to make this pudding, known as crema catalana (Catalan cream) or crema de San José. 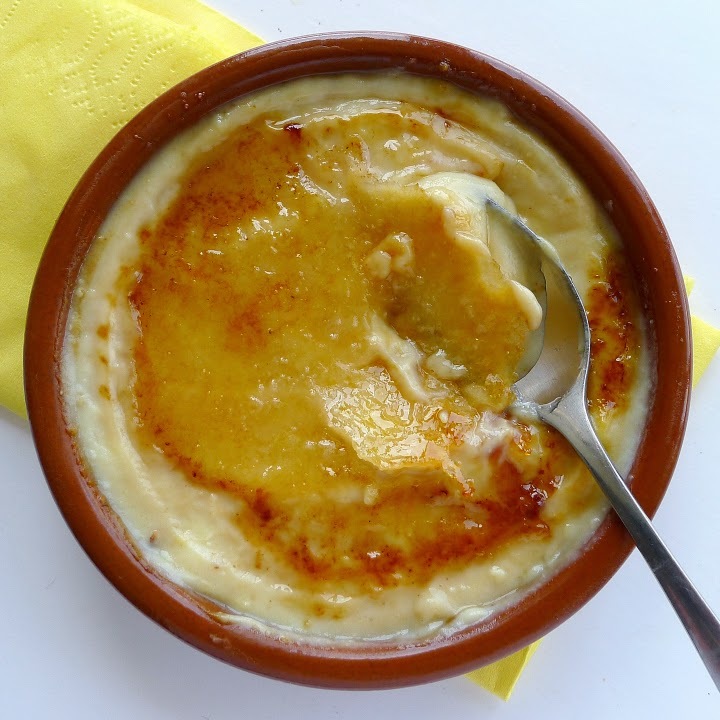 It is a lemon-cinnamon flavored custard with a crackly, burnt-sugar topping. 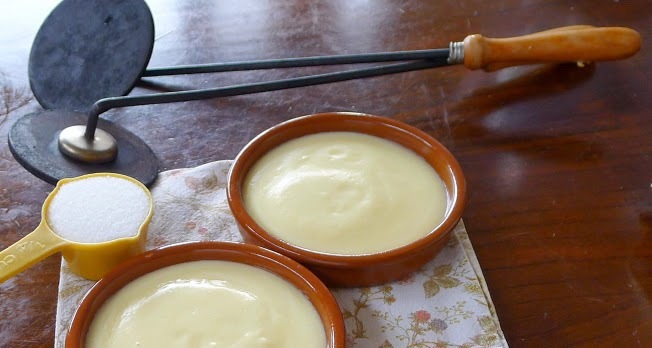 Egg and milk puddings such as this are especially favored in Spain during Lent. A lovely bit of sweetness during a season of abstinence. Traditional "salamander" for caramelizing the sugar. 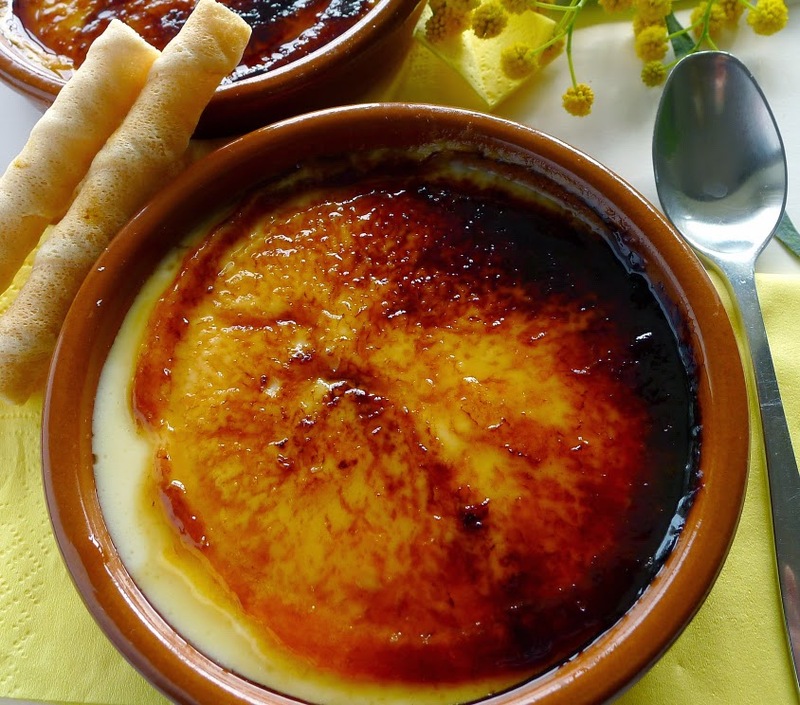 I used to make these custards on the cooking courses I gave. They were always a great success with students. But, oh no! Today, my first batch of puddings—finished with camera in hand—did not have that wonderful, crackly, caramelized tops. Instead, the sugar turned to liquid caramel and had a bitter taste. I’ve lost my touch. Lighter in color, but nicely crackly. I think I got the disk too hot. I tried again, heating it only two minutes, and holding it very lightly on the sugar about 20 seconds (less smoke). These had the desired crackly tops, but were lighter in color. I also tried caramelizing the sugar topping under the broiler of the (gas) stove. This doesn’t work so well, as it’s impossible to get the ramekins close enough to the flame. It took 15 minutes to get some color on the top. Best alternative is a small, kitchen blowtorch with a gas cylinder, making it easy to control the caramelization process. 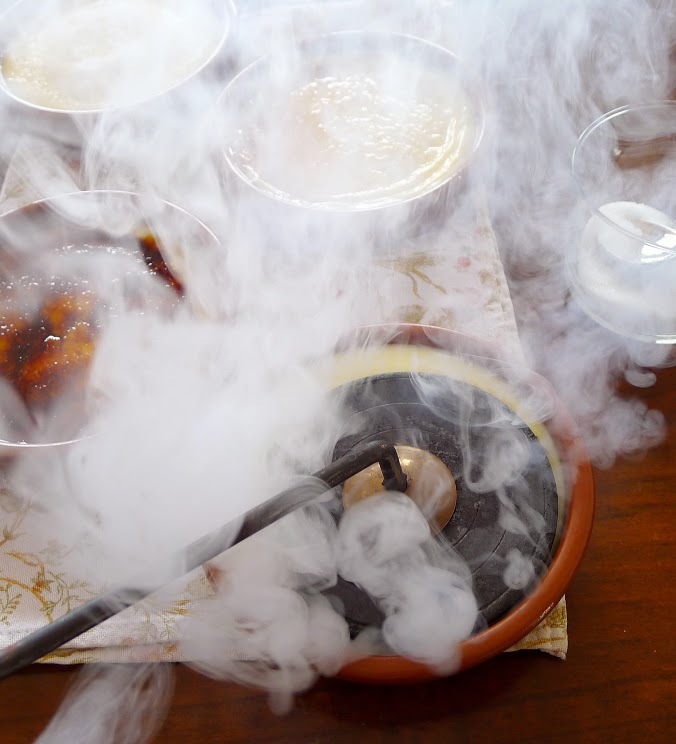 Another tip, if you are using the iron salamander, after caramelizing each pudding, immediately wipe the iron on a wet rag before reheating it. It’s best to do the sugar topping shortly before serving the custards, as with setting, the crackly tops soften. Heat the iron disk on a flame. Not quite so overheated, makes a better topping. 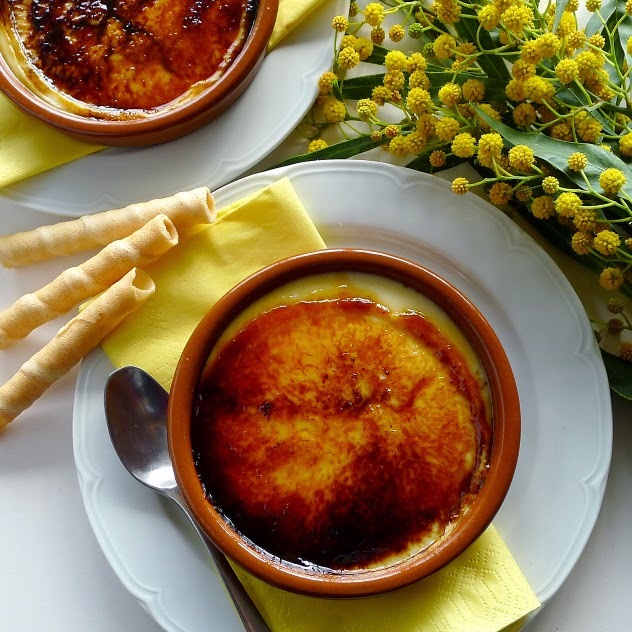 Custard with caramelized sugar topping, a lovely spring dessert. In a bowl beat the egg yolks with ¾ cup of sugar until pale. Place 3 ½ cups of milk in a pan with the lemon peel and cinnamon stick. 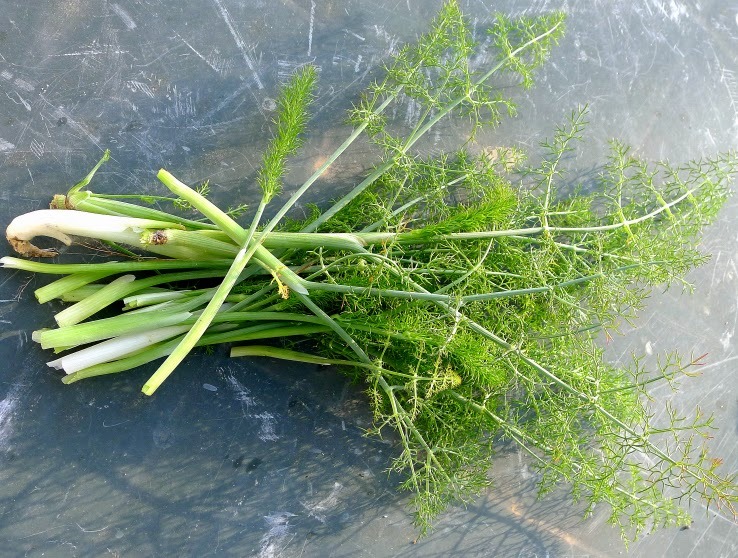 Bring to a boil, then remove from heat. 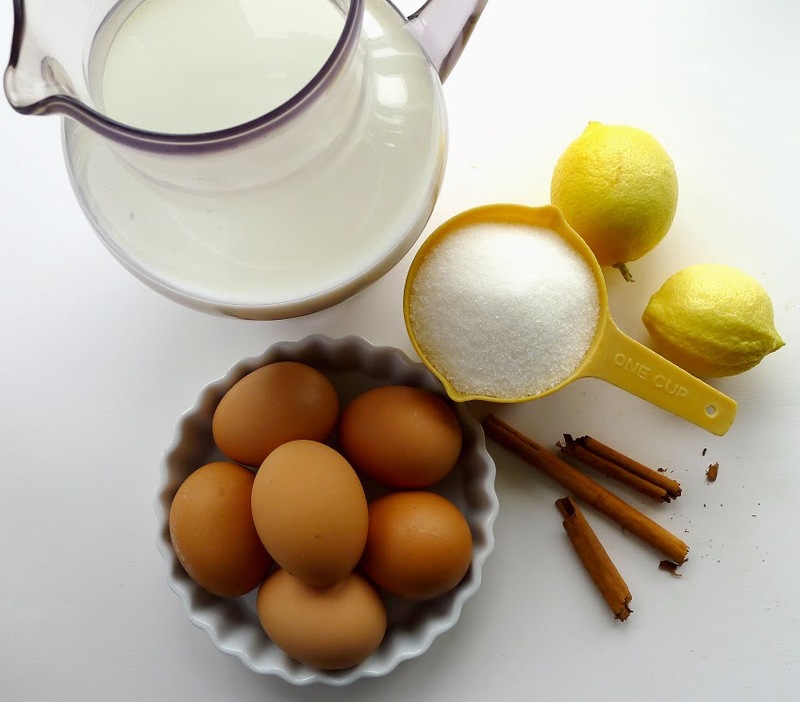 Remove the lemon peel and cinnamon and whisk the milk into the beaten yolks. Stir the remaining ½ cup milk and cornstarch together in a small bowl until smooth. Stir it into the custard mixture. Pour the mixture through a strainer into a clean pan. Cook the custard on a low heat, stirring constantly, until it just begins to bubble. Cook, stirring, for 3 minutes. 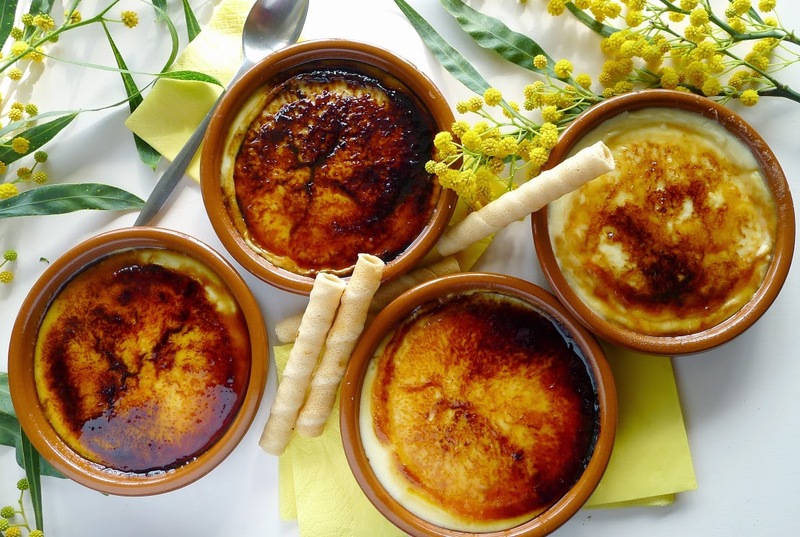 Remove from the heat and divide between 6 (5 ½ -inch) ramekins or shallow pudding dishes. Allow to cool, then refrigerate the custards. 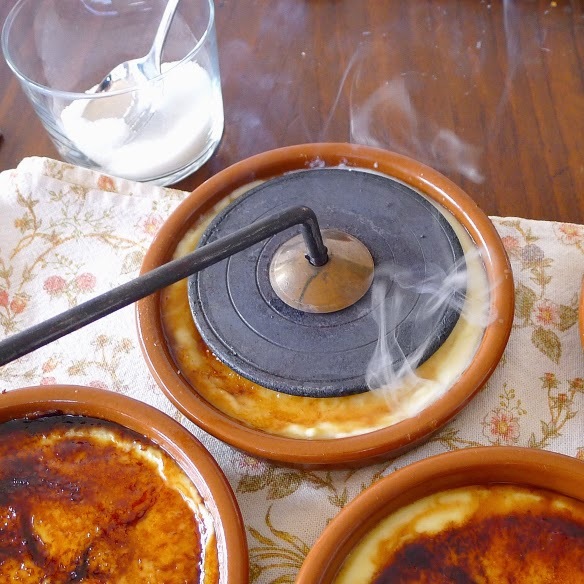 Shortly before serving, sprinkle the tops of the custards with the remaining sugar (about 1 ½ teaspoons each). 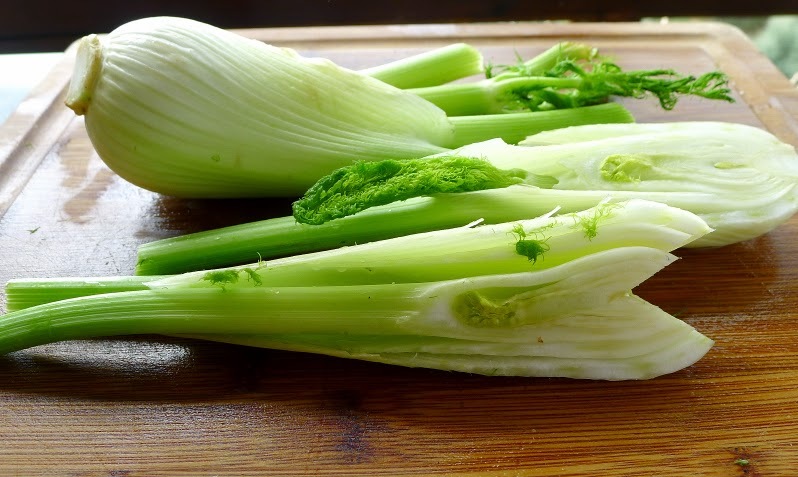 Caramelize the tops with a heated iron or kitchen blowtorch. 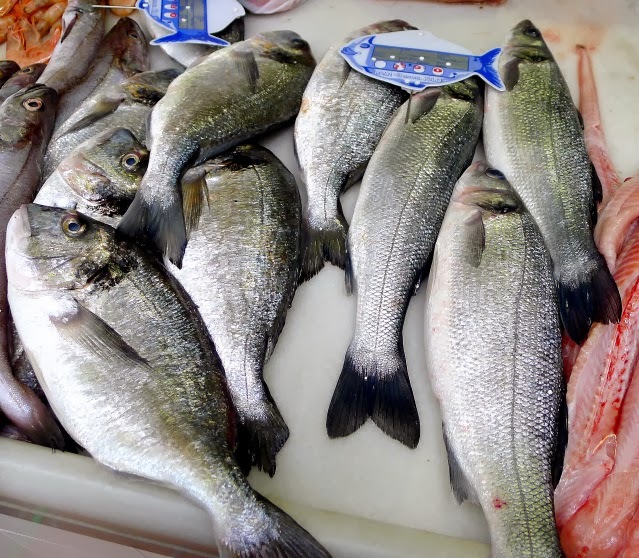 Farmed fish--gilt-head bream, left; sea bass, right. An offer I couldn’t resist—lubina, fresh, whole sea bass, at €2.50 each (about $3.50 for a fish weighing about 1 pound, including head). I bought a couple of them. 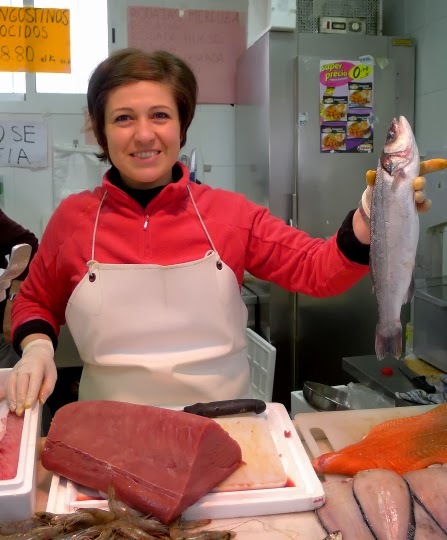 Two one-pound fish serve two, three or four persons, depending on how much fish you can eat. Me, I can easily eat a whole one all by myself. 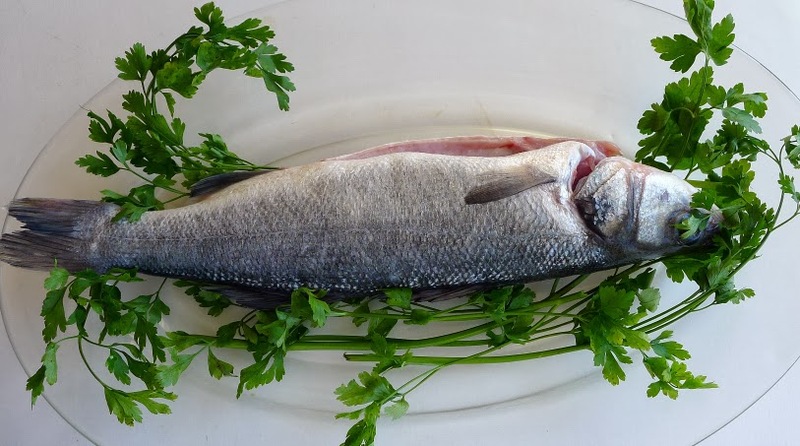 The bass, as well as dorada, gilt-head bream, come to local markets from a fish farm where they are raised in a manner respectful of the environment. The aquaculture station of Veta la Palma, located near the mouth of the Guadalquivir River, south of Sevilla and bordering the nature preserve of Coto Doñana, raises fish in artificial wetlands, a managed and sustainable ecosystem, created by pumping water through canals to create marshy, saline ponds where fish feed on natural algae and tiny shrimp. So healthy is the environment that it shelters 250 different bird species. 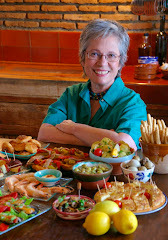 For more about Veta la Palma and aquaculture, see the links at the end of this post, following the recipe. Fresh fish from Veta la Palma is marketed in the US and may be available at your favorite restaurant. The fish I buy are excellent. 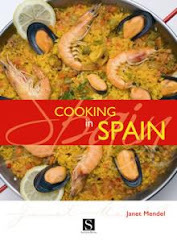 Here’s a way I first learned to prepare them at chiringuitos, beach shacks, on the Málaga and Cádiz coasts. 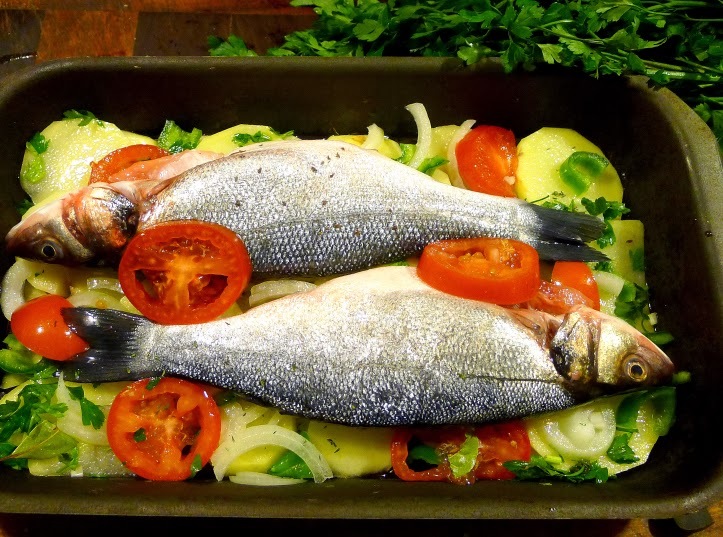 This recipe is typically made with a large whole fish, cooked in a rectangular metal pan called a besuguera, on a bed of sliced potatoes, onions, peppers and tomatoes. Ready for the oven--sea bass on a layer of potatoes and vegetables. A whole fish weighing 4-5 pounds will serve 4 to 6 people. As the market size of the aquaculture bass are about 1 pound, I usually use one per person. The fish need to be gutted and scales removed. 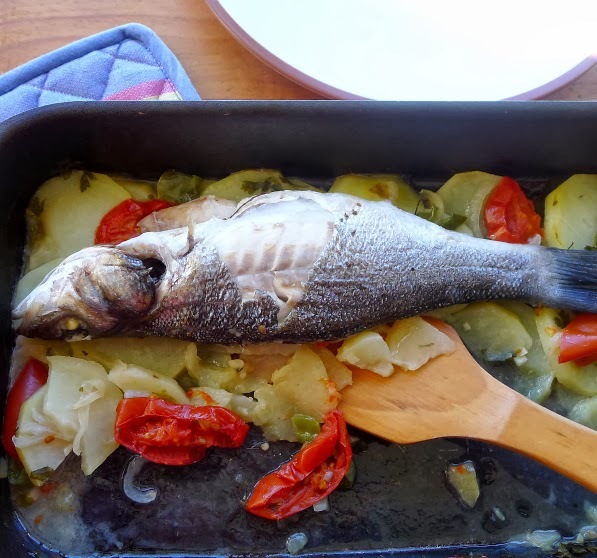 In Spain, the fish is baked whole, with the head. But, if your fish market sells fish with the head already removed, that’s fine too. If using individual-sized fish, I serve them whole, letting each person remove bones (provide dishes for the debris). But, if using a large fish, it is best filleted in the kitchen after baking and served onto heated dinner plates with scoops of potatoes. Potatoes soak up tasty juices from the fish, wine. Have the fish gutted and scaled. Rub fresh fish inside and out with salt and leave it to set for 30 minutes. Rinse and pat dry. Pour half the oil into a large flameproof oven pan (a roasting pan could be used) and add half the sliced potatoes. Sprinkle over half the garlic, parsley and peppers. Sprinkle with salt and pepper. Add all the sliced onions, most of the tomatoes, then the remaining potatoes, garlic, parsley and peppers. Sprinkle with salt and pepper. Place the fish on top of the potatoes and top with the remaining slices of tomato. Drizzle with remaining oil. Tuck in the pieces of bay leaf. Pour over the wine and water. Cover the pan with foil and bake until the potatoes are tender, about 35 minutes. Remove the foil during the last 15 minutes. Add water, if necessary, so the potatoes always have some liquid. 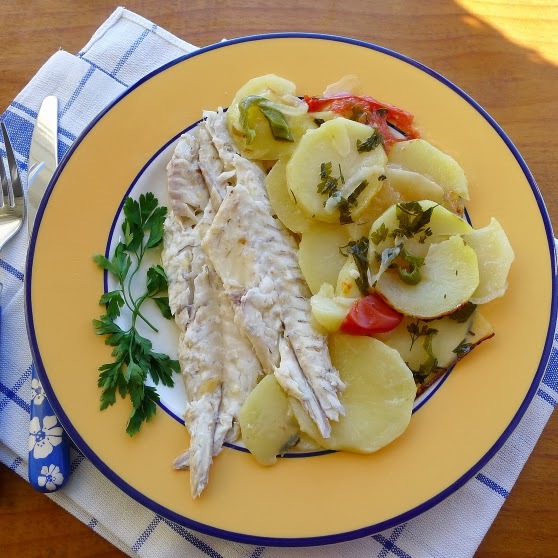 Baked sea bass with potatoes. Chef Dan Barber's TED talk about "How I fell in love with a fish," also about sustainable aquaculture at Veta la Palma. 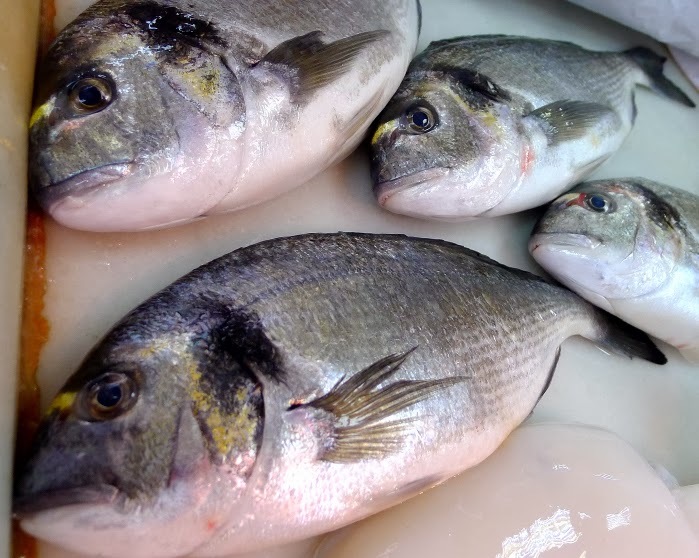 Gilt-head bream have a distinctive golden band between the eyes. 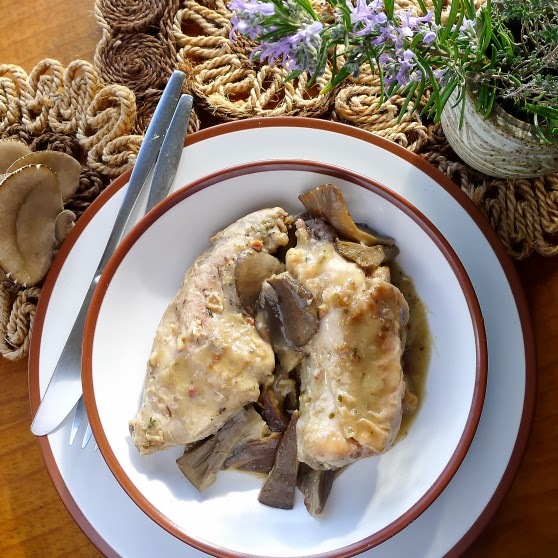 Tender pieces of rabbit with mushroom gravy. 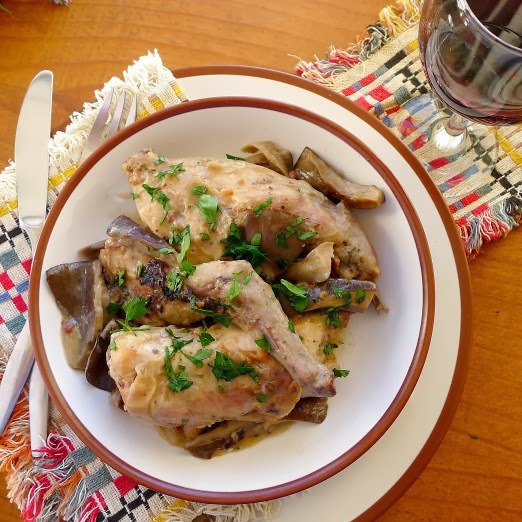 When I started collecting recipes from Spanish cooks—more than 40 years ago—I found very few chicken dishes and dozens of recipes for small game such as rabbit, hare, partridge and turtledove. In those days, a chicken’s purpose was to produce eggs, not dinner, whereas rabbit was free for the shooting. Nowadays, of course, battery-raised chicken can be purchased cheaply, so chicken is every-day food. 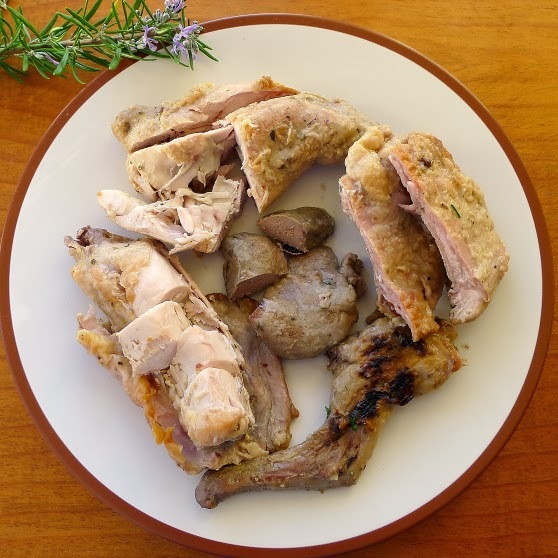 While few rural people depend on wild game anymore, rabbit, partridge and quail are also farm-raised and available in supermarkets. Which is where I found a special on rabbit (€3.50 per kilo) this week. A 3-pound rabbit cost me about $7.00. I had the butcher cut it into eight joints, serving four. 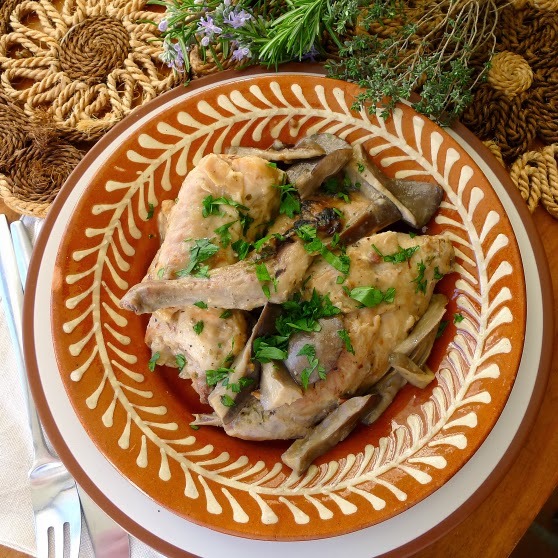 Rabbit can be called “the other white meat.” It’s delicate in flavor, extremely lean and very tender. Adding fat—preferably olive oil—and taking care not to overcook keep the meat from drying out. 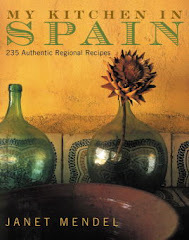 From my many rabbit recipes, I chose one that comes from the nearby sierra of Ronda (Andalusia). 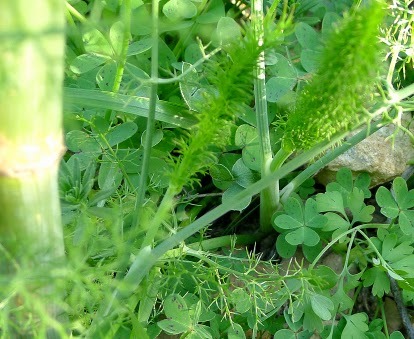 It calls for “wild mushrooms” and mountain herbs. 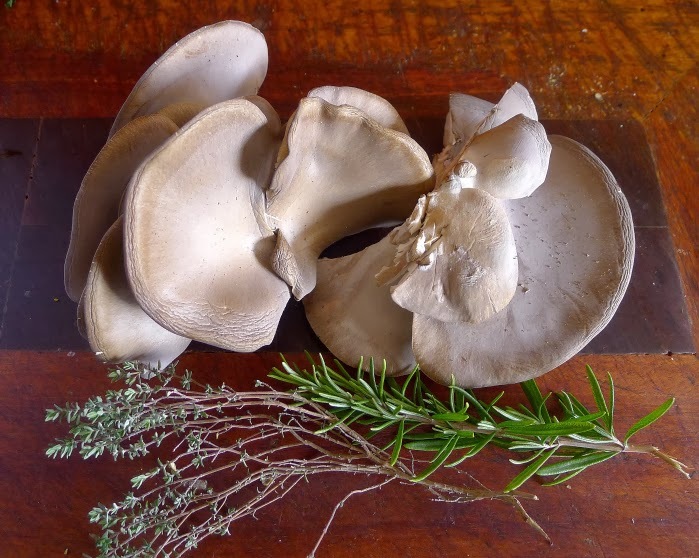 What I had available was an efflorescence of setas, oyster mushrooms, from a “grow bag,” in a dark, damp corner on my front porch, as well as clumps of “mountain” herbs—thyme and rosemary. Along with the mushrooms and herbs, both brandy and wine produce a delicious gravy. The gravy, though, reminds me of what Coleman Andrews wrote in his book, Catalan Cuisine, about “the brown food problem... Like traditional cooking around the world, it tends to be monochromatic, murky-looking brown.” Nothing that a sprinkling of chopped parsley or other herb can’t remedy. De las gallinas, el suelo; de los conejos, el techo. The best of the chicken is the “floor” (breast); the best of the rabbit, the “roof” (saddle). The meatiest rabbit pieces are the back legs and the saddle, or loin. Clockwise from the top: back leg and thigh, ribs (rabbit “chops”), front leg, saddle or loin. In the center, pieces of liver. Cut the rabbit into 8 joints. Combine the flour with the pepper, salt, oregano, rosemary and thyme. Dredge the rabbit pieces in the flour, patting off excess. Reserve remaining flour. Heat 3 tablespoons of the oil in a deep skillet and brown the rabbit on all sides. Remove the pieces as they are browned. Add remaining 1 tablespoon of oil to the pan. Add the bacon, mushrooms, onion and garlic and sauté until onions are softened. Stir in remaining flour in which the rabbit was coated. Add the brandy, wine and water. Return the pieces of rabbit to the pan. Simmer, covered, turning the pieces once, until rabbit is very tender, about 45 minutes.